Jaz Woods is a small town girl with a big city hustle from Cleveland OH. After completing her Bachelor of Arts degree in Communications from Kent State University, she relocated to NYC to pursue her Master’s degree in Hip Hop, Mass Media and Social Change at the Gallatin School of Individualized Study @ NYU. As a self-proclaimed child of Hip Hop and creator, Jaz utilized her multimedia experience to cultivate her Graduate Artistic Thesis entitled: “Good Kids, Mad Cities: Hip Hop and Black Millennials in the Age of Social Media.” Navigating both Hip Hop and digital information, the goal of her graduate thesis essay is to highlight the “post hip-hop generation”, born amidst a digital information age in order to dismantle any stereotypes placed onto black youth. 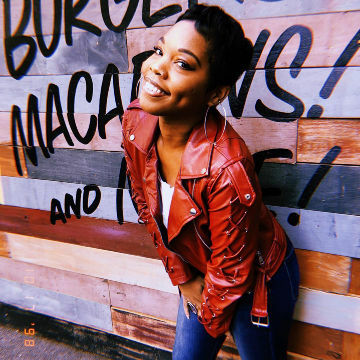 Her artistic thesis is accompanied by a podcast she mixed and edited called @BridginTheGap that features millennial’s, professors, DJs, musicians, and playlists. While attending both Kent State and NYU, Jaz completed various internships that include Page 31, Va$htie, HOT97/WBLS, and Roc Nation. She has also worked as a digital content manager and receptionist for celebrity hairstylist Neal Farinah. Upon graduating with her Master’s in May, she currently works as the Marketing Coordinator for Roc Nation Records, brand manages #AskDrJess, and serves as artists relations for Salomon Faye.